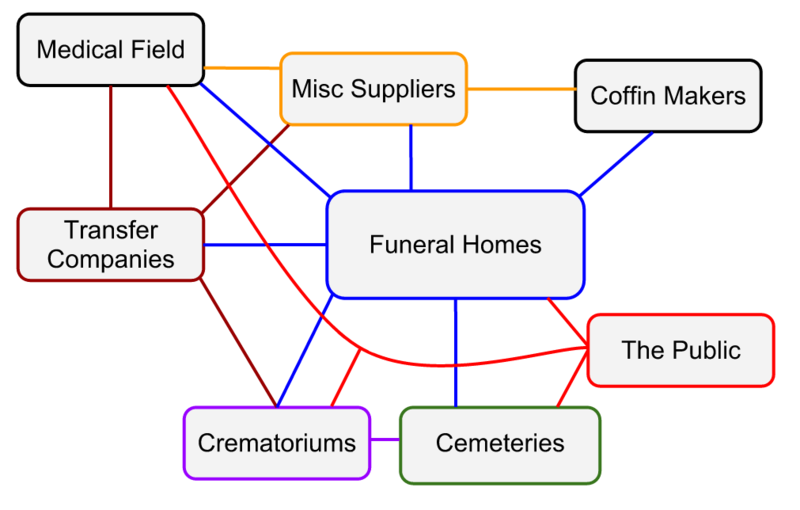 There is a surprisingly complex web of relationships between groups operating in the funeral industry. Below I finally tackle this topic and attempt to explain how the various companies interact with each other. To make things a little clearer I put together a diagram of which groups link up with each other. As in who interacts with who. Of course this diagram is not completely accurate as it is a simplification of complex dynamic relationships. But it should give some idea of how things work to those with limited knowledge of the industry. There are two key points to this diagram: firstly, I decided to include 'The Public' it to help make the graph relatable, even though this is not a company. To illustrate not just which companies connect but how they relate to others and operate in the industry. Secondly, I did not include celebrants, musicians, florists, religious leaders and so on, as this would make things too complex and messy. Essentially all these things can fit alongside the 'Funeral Homes' group anyway. Colour coded only to make things easier to see, colour, placement and size has no meaning. As you can see the funeral industry is really a complex web of interactions between different companies. It is not so simple as one or two companies, and it is much more than the funeral service or the processing of the body. The Public: Those using the funeral industry but not working or operating within it. Such as mourners or those pre-arranging their funeral. But it also includes the public who look at the industry, such as politicians and the media. The public heavily interacts with funeral homes, often going through them to sort the medical side, cemetery and crematorium. Generally the public only looks at funeral homes, cemeteries, crematoriums and the medical side. Leaving the other groups largely overlooked by the public eye. Funeral Homes: These are the companies who essentially organise and run funeral services. This is the group most likely to interact with the public, but also the one which interacts with all the other groups in some way. Cemeteries: These places mostly interact directly with funeral homes when it comes to organising a funeral. However, cemeteries do have a connection to the public. They are a place of much attention (like crematoriums) off the funeral. Cemeteries are shown in the media quite often, and talked about and thought about. There are well established perceptions of cemeteries. Crematoriums: Like cemeteries these places primarily interact with the funeral home on a direct level. Although the public does have a strong relationship to these places. Many have assumptions or notions of what these places are and what they involve. Coffin Makers: Companies who manufacture or import coffins. These companies do interact with the public, but it is rare. So rare I decided to not include this link in the diagram. For the most part these companies interact with funeral homes and other funeral suppliers. Misc Suppliers: This group is made up of companies who support the funeral industry from the background. Supplying and making products used by the industry behind the scenes. From medical supplies such as stretchers and gloves to converting cars into hearses or transfer vehicles. Transfer Companies: These are companies which specialise in transfers, doing the late night, long distance, police transfer and so on. Some of these companies do other things, like also assist in the mortuary. But for the most part they are transfer focused. Transfer companies interact with crematoriums in that they sometimes do early deliveries to these places. These companies also collect the deceased and paperwork from medical institutions (such as hospitals and nursing homes). So although transfer companies are relatively overlooked by the public they are an important link for more than just the funeral home. Medical Field: Many might not think of this as part of the funeral industry. But it is actually a common and key part. This group includes many aspects of the medical field who interact with the funeral industry. From institutions such as hospitals and nursing homes to individuals such as doctors. This group is a large part of where the person dies, and an incredibly important part of the paperwork process. So it has a direct relevance in the transfer of the body and in the paperwork of the funeral. Groups are not so ridged as displayed in the diagram. Some companies would fit into multiple groups at once, the best example of which is InvoCare. This one company owns funeral homes, cemeteries, crematoriums, coffin makers, has dedicated transfer crews and so on. Furthermore the relationships are two-way interactions, more complex than a simple line can demonstrate. Hopefully this post cleared up some of the questions about how different groups interact in the industry. While things are not as simple as I describe them this should at least give a decent understanding. I emailed you, but I cannot get any of the pictures to load on your webpages. :( Thank you for the helpful information!